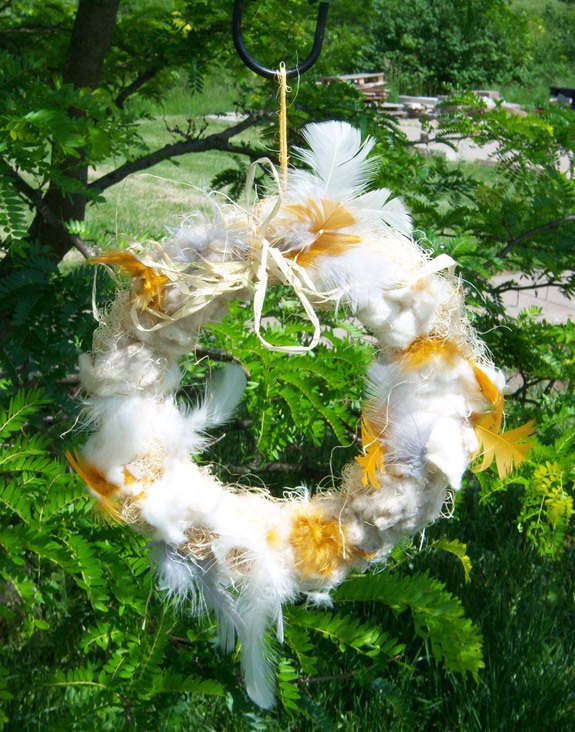 Hand a beautiful, all-natural nesting material wreath to help attract nesting wild birds to your backyard! Not only is it a benefit to North American nesting birds of many kinds, it can also be a very attractive feature in your garden, on your door… anywhere you want to hang it! It’s ready to hang and easy to refill. Our wreath is made of the only nesting material available that contains a mixture of five natural-colored materials preferred by North American Nesting Birds! Feathers, String, Cotton, Hemp, and Aspen fiber are all combined in a naturally colorful display! Because it contains a variety of nesting materials, this nesting material wreath attracts many more wild birds than cotton only mixtures. Hanging a nesting material wreath is one of our favorite signs that Spring and nesting season is here.